Now this dude is another interesting fellow. pausing for a pic with mr. Francis jr. Although he rarely does guiding, he manages his clients very well. This computer minded, downloading addict, and bike/beer fanatic person is a volunteer in maintaining this blog. @ echo valley with nethz, ammm,, and ammm. Like the ever Helpful and cute Gareth, he answers queries from tourists in forums and chats related to SAGADA. I would like to commend Daryl for guiding us well during our trip to sagada this weekend (Aug.28-29).. though mejo bitin sa oras, Daryl still manage to showcase the real sagada shangri-la to us. 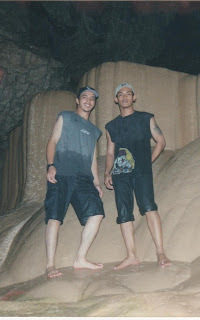 It was a really fun and adventurous experience.. Hope to be back again in sagada (hopefully once a year).